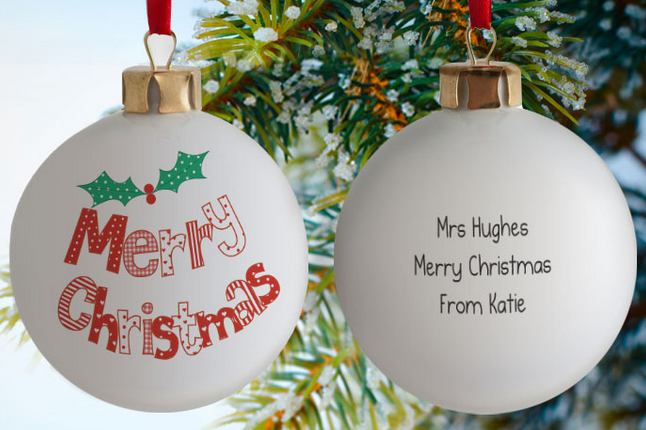 Personalised Christmas Baubles are a great idea to add an extra special touch to your Xmas decorations. Whether you opt for a real Christmas tree or an artificial one, it can still be made even better with the additional of a personalised Christmas bauble which will delight and surprise visitors. Our friends at GettingPersonal.co.uk have a range of attractive christmas baubles and decorations starting at only £9.99, featuring loads of Xmas scenes including Rudolph, Santa and Robin red breast. One side of the bauble can be personalised with three short lines of text. Do you know someone that has been blessed with a baby this year? A really lovely Christmas bauble which becomes a great keepsake is the personalised “my first Christmas” bauble. This one from Getting Personal, costing £12.99, has a picture of Santa with the baby’s name and year of birth on the front, and a personalised message can be added to the back. As well as baubles, why not check out these wonderful vintage Christmas signs which will delight your visitors this Christmas time. Add any name or names to this sturdy, wooden sign which will last for many Christmasses to come. The personalised vintage Christmas sign costs £39.99.